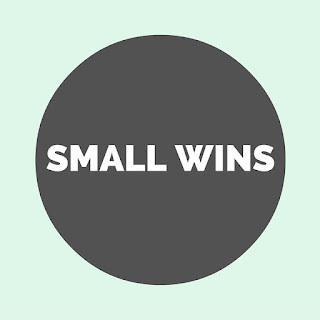 Portland at Syndicate: Setting Yourself Up For "Small Wins"
Setting Yourself Up For "Small Wins"
1. Set your environment up for success. We can't control every factor in our environments but we can add little things here and there to set ourselves up for more pleasant experiences. If you have a hard time focusing with noise, buy some acoustic cancelling headphones. Do you find yourself feeling down in the middle of the day? Put some cheerful artwork in your space. These little things can pull us out of our own heads and give us a little jolt of joy in the middle of a tough day. 2. Appreciative inquiry. Instead of thinking of all of the things that are wrong with any given situation, find at least one thing that went right. Let's say that you're planning a conference and your keynote falls through. You're probably going to be feeling a huge wave of panic and not remember that you snagged the best caterer in town or that you still have a list of amazing backup speakers from your brainstorming session. Pulling yourself out of a panicked state is hard but it also calms you down so that you can proceed logically. 3. Everything doesn't have to be or appear to be perfect. Have you ever heard the phrases... done is better than perfect or don't let perfect be the enemy of great? These phrases remind me that not everything I do has to be a shining beacon of perfection. If someone needs something from me with a tight turnaround, I try to remind them that I can get it done in a high quality fashion but not perfectly. Being able to deliver and help someone out is the win! 4. Sometimes, quitting is winning. We've all had those projects that we've gotten to the middle of and realize that it is completely doomed. Our first instinct is to re-strategize in order to MAKE it work. Often this is a really destructive impulse, just because you sunk a lot of time and resources into something doesn't mean that it is ultimately the right way to go. This idea is more generally called the sunk cost fallacy. If you can see no way to win, win by quitting.